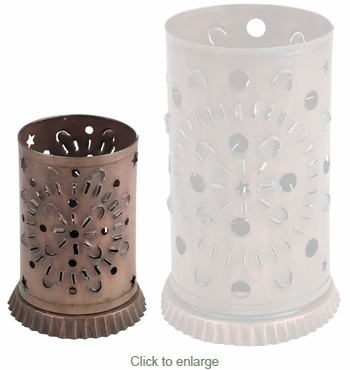 These beautiful punched tin luminarias make great gifts or an attractive display of light for your home decor. Each decorative candle luminary is hand cut and hand punched using aged tin one at a time by Mexican metalcraft artisans. Expect slight variations in size, punched tin design and finish of the aged tin on these hand made punched tin luminaries. The photo shows the size relationship of a small luminaria to the larger luminaria. The large version is represented by a lightened image. All luminarias will be the darker aged tin. Sold in pairs. Price is for 2 small luminarias. Use the quantity box for the number of sets of 2 you would like to order.